We have found 4745 records with your search parameters. Only the first 200 records will be displayed. Please restrict your search further! Poster: 8th International Workshop on Surface Physics, Trzebnica, Poland; 06-26-2017 - 06-30-2017; in: "IWSP-2017 Program & Abstracts", (2017), 44. Poster: 8th International Workshop on Surface Physics, Trzebnica, Poland; 06-26-2017 - 06-30-2017; in: "IWSP-2017 Program & Abstracts", (2017), 40. Talk: 8th International Workshop on Surface Physics, Trzebnica, Poland (invited); 06-26-2017 - 06-30-2017; in: "IWSP-2017 Program & Abstracts", (2017), 9. Talk: ACM CCS 2017 Conference on Computer and Communications Security, Dallas, USA; 10-30-2017 - 11-03-2017; in: "CCS '17 Proceedings of the 2017 ACM SIGSAC Conference on Computer and Communications Security", ACM Digital Library, New York (2017), ISBN: 978-1-4503-4946-8; 409 - 423. Talk: 1st International Conference on Functional Nanomaterials and Nanodevices NANO-MAT2017, Budapest; 09-24-2017 - 09-27-2017; in: "Intern. Conference on Functional Nanomaterials and Nanodevices", zape4at.com, (2017), ISBN: 978-954-2987-31-4; 1. Talk: TSFP10, Chicago; 07-06-2017 - 07-09-2017; in: "TSFP10", (2017). Talk: APS-DFD 2017, Denver; 11-19-2017 - 11-21-2017; in: "APS-DFD 2017", (2017). Talk: 88th Annual Meeting of the International Association of Applied Mathematics and Mechanics (GAMM), Weimar; 03-06-2017 - 03-10-2017; in: "Proceedings of the annual GAMM meeting", Proceedings in Applied Mathematics and Mechanics, 17 (2017), 2 pages. Talk: 4. qualityaustria Umwelt- und Energieforum, Wien (invited); 09-28-2017; in: "Vorträge des 4. qualityaustria Umwelt- und Energieforum", https://www.qualityaustria.com/index.php?id=5424, (2017), 1 - 24. Talk: Jahrestagung Arbeitskreis Städtebauliche Denkmalpflege 2017, Dortmund (invited); 10-08-2017; in: "Weiterbauen. Werkzeuge für die Zeitschichten der Stadt", (2017). Talk: 19. Kolloquium Programmiersprachen und Grundlagen der Programmierung (KPS'17), Weimar; 09-25-2017 - 09-27-2017; in: "19. Kolloquium Programmiersprachen und Grundlagen der Programmierung (KPS'17)", (2017), 20 - 28. Talk: EuroForth, Bad Voeslau; 09-08-2017 - 09-10-2017; in: "33rd EuroForth Conference", (2017), 25 - 36. Talk: Forth-Tagung 2017, Kalkar, Deutschland; 04-21-2017 - 04-23-2017; in: "Forth-Tagung 2017 in Kalkar", https://wiki.forth-ev.de/doku.php/events:tagung-2017, (2017), 17 pages. Talk: 25th European Signal Processing Conference (EUSIPCO) 2017, Kos, Greece (invited); 08-28-2017 - 09-02-2017; in: "2017 25th European Signal Processing Conference (EUSIPCO)", (2017), ISBN: 978-0-9928626-8-8; 1689 - 1693. Talk: IEEE International Integrated Reliability Workshop (IIRW), Fallen Leaf Lake, CA, USA; 10-08-2017 - 10-12-2017; in: "Proceedings of the 2017 IEEE Integrated Reliability Workshop (IIRW)", (2017), 1 - 5. Talk: TU Wien Workshops 2017, Wien; 2017; in: "Workshops TU Wien", (2017), 7 pages. Poster: 7th International Workshop on Computational Advances in Multi-Sensor Adaptive Processing (CAMSAP), Curacao, Durch Antilles; 12-10-2017 - 12-13-2017; in: "Proeceedings International Workshop on Computational Advances in Multi-Sensor Adaptive Processing (CAMSAP)", IEEE, (2017), ISBN: 978-1-5386-1251-4; 1 - 5. Talk: International Conference on Intelligent Autonomous Systems, Shanghai, China; 02-2017; in: "An RGB-D Visual Application for Error Detection in Robot Grasping Tasks", (2017), 11 pages. Talk: OCEANS 2017 - Aberdeen, Aberdeen, UK; 06-19-2017 - 06-22-2017; in: "Increasing underwater manipulation autonomy using segmentation and visual tracking", (2017), 5 pages. Talk: 2017 IEEE/RSJ International Conference on Intelligent Robots and Systems (IROS 2017), Vancouver; 09-24-2017 - 09-28-2017; in: "Proceedings of the IEEE/RSJ International Conference on Intelligent Robots and Systems (IROS)", (2017), ISSN: 2153-0866; 8 pages. Poster: 11th International Conference on Transportation survey methods, Esterel, Québec; 09-24-2017 - 09-29-2017; in: "Transportation Research Procedia", Elsevier Ldt., 32 (2017), ISSN: 2352-1465; 524 - 534. Talk: Fachtagung "Experimentelle Strömungsmechanik", Karlsruhe; 09-05-2017 - 09-07-2017; in: "Fachtagung "Experimentelle Strömungsmechanik"", German Association for Laser Anemometry GALA e.V., (2017), ISBN: 978-3-9816764-3-3; 1 - 6. Talk: 12th international enviBUILD Conference, 7th and 8th of September 2017 - Buildings and Environment, TU Wien (invited); 09-07-2017 - 09-08-2017; in: "12th international enviBUILD Conference, 7th and 8th of September 2017 - Buildings and Environment: From Research to Application BOOK OF ABSTRACTS", (2017), 8. Talk: 14th EAI International Conference on Mobile and Ubiquitous Systems: Computing, Networking and Services (MobiQuitous 2017), Melbourne, Australia; 11-07-2017 - 11-10-2017; in: "Proceedings of the 14th EAI International Conference on Mobile and Ubiquitous Systems: Computing, Networking and Services (MobiQuitous 2017)", ACM, (2017), ISBN: 978-1-4503-5368-7; 96 - 105. Talk: AESOP Congress 2017, Lissabon; 07-11-2017 - 07-14-2017; in: "Space of dialog for places of dignity", (2017), ISBN: 978-989-99801-3-6; 1658 - 1666. Talk: 88th Annual Meeting of the International Association of Applied Mathematics and Mechanics (GAMM), Weimar; 03-06-2017 - 03-10-2017; in: "88th Meeting of the Internatinal Association of Applied Mathematics and Mechanics", C. Könke, C. Trunk (ed. ); Proceedings in Applied Mathematics and Mechanics, 17 (2017), ISSN: 1617-7061; 667 - 668. Talk: Proceedings of 5th International Conference on Serviceology. Short papers and posters, Wien; 07-12-2017 - 07-14-2017; in: "Proceedings of 5th International Conference on Serviceology. Short papers and posters", OMiLAB Verlag, (2017), ISBN: 978-3-902826-05-3; 199 - 202. Talk: 19th International Conference on Information Integration and Web-based Applications & Services (iiWAS2017), Salzburg; 12-04-2017 - 12-06-2017; in: "Proceedings of iiWAS", ACM, (2017), 241 - 247. Talk: European Fuel Cell Conference & Exhibition, Neapel; 12-12-2017 - 12-15-2017; in: "Proceedings of the 7th European fuel cell Piero Lunghi conference", (2017), ISBN: 978-88-8286-324-1; 83 - 84. Talk: SPIE 10247, Bio-MEMS and Medical Microdevices III, Barcelona, Spain; 05-08-2017 - 05-10-2017; in: "Proceedings SPIE 10247, Bio-MEMS and Medical Microdevices III", (2017), 4 pages. Talk: 10th IEEE International Conference on Service Oriented Computing and Applications (SOCA 2017), Kanazawa, Japan (invited); 11-22-2017 - 11-25-2017; in: "Proceedings of the 10th IEEE International Conference on Service Oriented Computing and Applications (SOCA 2017)", IEEE, (2017), ISBN: 978-1-5386-1327-6; 164 - 172. Talk: 13th International Conference on Semantics, Knowledge and Grids, SKG 2017, Beijing, China; 08-14-2017 - 08-15-2017; in: "Proceedings of the 13th International Conference on Semantics, Knowledge and Grids, SKG 2017", H. Zhuge, X. Sun (ed. ); IEEE, (2017), ISBN: 978-1-5386-2558-3; 77 - 84. Talk: 18th Doctoral Symposium of the 18th International Middleware Conference (Middleware 2017), Las Vegas, NV, USA; 12-11-2017 - 12-15-2017; in: "Proceedings of the 18th Doctoral Symposium of the 18th International Middleware Conference (Middleware 2017)", ACM, (2017), ISBN: 978-1-4503-5199-7; 3 - 4. Talk: International Electron Devices Meeting (IEDM), San Francisco, CA, USA; 12-02-2017 - 12-06-2017; in: "Proceedings of the 2017 International Electron Devices Meeting (IEDM) Technical Digest", (2017), ISBN: 978-1-5386-3559-9; 310 - 313. Talk: International Electron Devices Meeting (IEDM), San Francisco, CA, USA (invited); 12-02-2017 - 12-06-2017; in: "Proceedings of the 2017 International Electron Devices Meeting (IEDM)", (2017), 4 pages. Talk: European Conference on Thermoelectrics (ECT), Padova, Italy; 09-25-2017 - 09-27-2017; in: "Book of Abstracts 15th European Conference on Thermoelectrics", (2017). Talk: FSV-Seminar 2017 - Umgang mit (kontaminiertem) Aushub, Wien; 10-23-2017; in: "Umgang mit (kontaminiertem) Aushub", (2017), 1 - 39. Talk: 20. Ulusal Mekanik Kongresi, Bursa; 09-05-2017 - 09-09-2017; in: "Book of 20. Ulusal Mekanik Kongresi", (2017), 638 - 647. Talk: 24th IEEE International Conference on High Performance Computing (HiPC 2017), Jaipur, India; 12-18-2017 - 12-21-2017; in: "Proceedings of the 24th IEEE International Conference on High Performance Computing (HiPC 2017)", IEEE, (2017), ISBN: 978-1-5386-2294-0; 348 - 357. Talk: 2017 GMA-Fachausschuss 1.40 "Theoretische Verfahren der Regelungstechnik", Anif/Salzburg; 09-18-2017 - 09-20-2017; in: "Tagungsband GMA-Fachausschuss 1.40 "Theoretische Verfahren der Regelungstechnik"", Christian-Albrechts-Univeristät zu Kiel, Lehrstuhl für Regelungstechnik, Kiel (2017), ISBN: 978-3-9819634-0-3; 14 - 39. Talk: 2017 GMA-Fachausschuss 1.30 "Modellbildung, Identifikation und Simulation in der Automatisierungstechnik", Anif/Salzburg; 09-20-2017 - 09-22-2017; in: "Tagungsband GMA-Fachausschuss 1.30 "Modellbildung, Identifikation und Simulation in der Automatisierungstechnik"", Christian-Albrechts-Univerist at zu Kiel, Lehrstuhl für Regelungstechnik, Kiel (2017), ISBN: 978-3-9819634-0-3; 314 - 340. Talk: TAP 2017 - 22nd International Transport and Air Pollution Conferences, Zürich, Switzerland; 11-15-2017 - 11-16-2017; in: "22nd International Transport and Air Pollution Conferences", (2017), 1 - 9. Talk: 21st EMAN Conference Sustainability Accounting and Control for Smart Cities, Liege; 06-27-2017 - 06-29-2017; in: "Municipalities´understanding and importance of Smart Cities: an explorative analysis in Belgium", (2017). Talk: 23rd IEEE International Symposium on Asynchronous Circuits and Systems (ASYNC 2017), San Diego, California; 05-21-2017 - 05-24-2017; in: "Proceedings 2017 23rd IEEE International Symposium on Asynchronous Circuits and Systems (ASYNC 2017)", IEEE Computer Society, 10662 Los Vaqueros Circle (2017), ISBN: 978-1-5386-2749-5; 25 - 32. Talk: 31st International Symposium on Distributed Computing (DISC 2017), Wien; 10-17-2017 - 10-19-2017; in: "Leibniz International Proceedings in Informatics (LIPIcs)", (2017), ISSN: 1868-8969; 3 pages. Talk: 23rd IEEE International Symposium on Asynchronous Circuits and Systems (ASYNC 2017), San Diego, California; 05-21-2017 - 05-24-2017; in: "Proceedings 2017 23rd IEEE International Symposium on Asynchronous Circuits and Systems (ASYNC 2017)", IEEE Computer Society, 10662 Los Vaqueros Circle (2017), ISBN: 978-1-5386-2749-5; 49 - 56. Talk: 88th Annual Meeting of the International Association of Applied Mathematics and Mechanics (GAMM), Weimar; 03-06-2017 - 03-10-2017; in: "Proceedings in Applied Mathematics and Mechanics", Wiley, 17 (2017), ISSN: 1617-7061; 683 - 684. Talk: Solar Paces 2017, Casablanca, Morocco; 10-02-2017 - 10-05-2017; in: "Proceedings of the Solar Paces 2017", (2017), 8 pages. Poster: 3rd ESTAD - European Steel Technology and Application Days, Wien; 06-26-2017 - 06-29-2017; in: "Proceedings", (2017), Paper ID Paper ID: 65, 9 pages. Poster: IEEE 20th International Conference on Intelligent Transportation Systems, Yokohama, Japan; 10-16-2017 - 10-19-2017; in: "IEEE Xplore", (2017), ISSN: 2153-0017; 1 - 6. Talk: IFAC World Congress 2017, Toulouse; 07-09-2017 - 07-14-2017; in: "IFAC-PapersOnLine", IFAC-PapersOnLine, 50/1/ (2017), 12835 - 12840. Talk: IEEE Computer Security Foundations Symposium, Santa Barbara, USA; 08-21-2017 - 08-25-2017; in: "IEEE 30th Computer Security Foundations Symposium CSF 2017", IEEE Xplore Digital Library, (2017), ISBN: 978-1-5386-3217-8; Paper ID 3, 15 pages. Talk: 2nd International Conference on Sustainable Energy and Environmental Challenges (SEEC-2018), Bangalore, Indien; 12-31-2017 - 01-03-2018; in: "Book of Abstracts", (2017), 50 - 51. Talk: 17. Österreichische Chemietage 2017, Salzburg (invited); 09-25-2017 - 09-28-2017; in: "17. Österreichische Chemietage", (2017), ISBN: 978-3-900554-76-7; Paper ID MS-24, 1 pages. Talk: Gesteinstagung 2017, Aschaffenburg (invited); 11-22-2017 - 11-23-2017; in: "Gesteinstagung 2017", (2017), 1. Talk: 36. Hagener Symposium Pulvermetallurgie, Hagen; 11-30-2017 - 12-01-2017; in: "Pulvermetallurgie - Schlüssel zur Mobilität", Pulvermetallurgie in Wissenschaft und Praxis, 33 (2017), ISBN: 978-3-946537-36-6; 1 - 23. Poster: 10. Internationale Energiewirtschaftstagung IEWT 2017, Wien; 02-15-2017 - 02-17-2017; in: "IEWT 2017; Klimaziele 2050: Chancen für einen Paradigmenwechsel? ", (2017), 452 - 453. Poster: 7th International Symposium on Data-driven Process Discovery and Analysis (SIMPDA 2017), Neuchâtel, Switzerland; 12-06-2017 - 12-08-2017; in: "Data-driven Process Discovery and Analysis 2017. ", P. Ceravolo, M. Van Keulen, K. Stoffel (ed. ); CEUR Workshop Proceedings, Vol-2016 (2017), ISSN: 1613-0073; 149 - 150.
accepted as talk for: 23. Industriebauseminar, Kuppelsaal TU Wien, Wien (invited); 09-11-2017 - 09-12-2017; in: "Construction Goes Digital", (2017). Talk: enviBUILD 2017 - Buildings and Environment, TU Wien, Wien (invited); 09-07-2017 - 09-08-2017; in: "Proceedings of the 12th International enviBUILD 2017 Conference", Applied Mechanics and Materials, 887 (2017), ISSN: 1662-7482; 327 - 334. Talk: 13th International Conference Organization, Technology and Management in Construction (OTMC) 2017, Porec, Kroatien (invited); 09-27-2017 - 09-30-2017; in: "Conference Proceedings of the 13th OTMC Conference 2017", (2017), ISBN: 978-953-8168-21-5; 486 - 501. Talk: IEEE International Conference on Mechatronics, Churchill, VIC, Australia; 02-13-2017 - 02-15-2017; in: "IEEE International Conference on Mechatronics", IEEE, (2017), 226 - 231. Poster: 9th BIC International Conference, Rome, Italy; 09-15-2017 - 09-17-2017; in: "Blood Transfusion Abstract Book", Blood Transfusion, 15 Suppl 3 (2017), ISSN: 1723-2007; 501. Talk: SCCG, Mikulov (invited); 05-15-2017 - 05-17-2017; in: "Proceedings of the 33rd Spring Conference on Computer Graphics (SCCG 2017)", ACM, (2017), ISBN: 978-1-4503-5107-2. Talk: 17. Österreichische Chemietage 2017, Salzburg (invited); 09-25-2017 - 09-28-2017; in: "17. Österreichische Chemietage 2017", (2017). Talk: 24th International Symposium on Electro- and Liquid Phase Separation Techniques ITP 2017, Gdansk, Polska (invited); 09-10-2017 - 09-13-2017; in: "Book of abstracts", (2017), 59. Talk: 23rd International Symposium on Separation Sciences (ISSS 2017), Wien; 09-19-2017 - 09-22-2017; in: "Book of Abstracts", H. Krebs, E. Rosenberg (ed. ); (2017), ISBN: 978-3-9504017-7-6; OP-28. Keynote Lecture: 23rd International Symposium on Separation Sciences (ISSS 2017), Wien (invited); 09-19-2017 - 09-22-2017; in: "Book of Abstract", H. Krebs, E. Rosenberg (ed. ); (2017), ISBN: 978-3-9504017-7-6; KL3. Talk: International Confernce on Computer Vision Systems, Shenzhen, China; 07-10-2017 - 07-13-2017; in: "ICVS Conference Proceedings 2017", (2017), 14 pages. Talk: 18th Towards Autonomous Robotic Systems Conference 2017, Surrey, GB; 07-19-2017 - 07-21-2017; in: "18th TAROS Conference 2017", (2017), 14 pages. Poster: Euroanalysis 2017, Stockholm; 08-28-2017 - 09-01-2017; in: "Poster Presentations Abstracts", Poster 69 (2017), 73. Poster: Proceedings of the 65th American Society of Mass Spectrometry Conference, Indianapolis, US; 06-04-2017 - 06-08-2017; in: "Proceedings of the 65th American Society of Mass Spectrometry Conference", (2017). Poster: 28th ANNUAL CONFERENCE OF THE EUROPEAN SOCIETY FOR BIOMATERIALS (ESB), Athens, Greece; 09-04-2017 - 09-08-2017; in: "Program", (2017). Talk: EcoSta 2017 - 1st International Conference on Econometrics and Statistics, Hong Kong (invited); 07-31-2017 - 08-03-2017; in: "Programm and Abstracts: 1. International Conference on Econometrics and Statistics (EcoSta 2017)", (2017), ISBN: 978-9963-2227-2-8; 88. Talk: Biotrans 2017, Budapest, Ungarn (invited); 07-09-2017 - 07-13-2017; in: "Biotrans 2017, 13th International Symposium on Biocatalysis and Biotransformations", (2017), 468 pages. Talk: International Symposium for Production Research, Vienna; 09-13-2017 - 09-15-2017; in: "Proceedings of the International Symposium for Production Research", (2017), 8 pages. Talk: 22nd ITS World Congress, Strasbourg; 06-19-2017 - 06-22-2017; in: "Proceedings of the 22nd ITS World Congress", (2017), Paper ID TP0916, 7 pages. Talk: ÖGEW/DGMK Herbsttagung 2017, Wien; 11-30-2017 - 12-01-2017; in: "Web Tagungsunterlagen der ÖGEW/DGMK Herbstveranstaltung", (2017), 11 pages. Talk: 27th CRC REAL WORLD EMISSIONS WORKSHOP, Los Angeles; 03-26-2017 - 03-29-2017; in: "Proceedings of 27th CRC REAL WORLD EMISSIONS WORKSHOP", Coordinating Research Council, (2017), 9 pages. Talk: 2nd Suicide & Self-Harm Early Career Researchers´ Forum (ECRF17), Glasgow, UK (invited); 06-08-2017 - 06-09-2017; in: "2nd Suicide & Self-Harm Early Career Researchers´ Forum (ECRF17)", SBRL, (2017), 14. Poster: 23rd International Symposium on Separation Sciences (ISSS 2017), Wien; 09-19-2017 - 09-22-2017; in: "Book of Abstracts", (2017). Poster: 23rd International Symposium on Separation Sciences (ISSS 2017), Wien; 09-19-2017 - 09-22-2017; in: "ISSS 2017 - 23rd International Symposium on Separation Sciences, Book of Abstracts", (2017), ISBN: 978-3-9504017-7-6; 204. Poster: 23rd International Symposium on Separation Sciences (ISSS 2017), Wien; 09-19-2017 - 09-22-2017; in: "ISSS 2017 - 23rd International Symposium on Separation Sciences, Book of Abstracts", (2017), ISBN: 978-3-9504017-7-6; 184. Poster: 23rd International Symposium on Separation Sciences (ISSS 2017), Wien; 09-19-2017 - 09-22-2017; in: "ISSS 2017 - 23rd International Symposium on Separation Sciences, Book of Abstracts", (2017), ISBN: 978-3-9504017-7-6; 270. Poster: 37. Wissenschaftlich-Technische Jahrestagung der DGPF, Würzburg, Germany; 03-08-2017 - 03-10-2017; in: "Kulturelles Erbe erfassen und bewahren - Von der Dokumentation zum virtuellen Rundgang", Publikationen der Deutschen Gesellschaft für Photogrammetrie, Fernerkundung und Geoinformation (DGPF) e.V., 26 (2017), ISSN: 0942-2870; 498 - 507. Poster: 23rd International Symposium on Separation Sciences (ISSS 2017), Wien; 09-19-2017 - 09-22-2017; in: "ISSS 2017 - 23rd International Symposium on Separation Sciences, Book of Abstracts", (2017), ISBN: 978-3-9504017-7-6; 269. Talk: International Conference on Production Research (ICPR 24), July 31st - August 3th 2017,, Poznan, Poland; 07-31-2017 - 08-03-2017; in: "Proceedings of 24th International Conference on Production Research (ICPR 24)", (2017), ##. Talk: 13th International Symposium on Functional π-Electron Systems (Fπ-13), Hong Kong; 06-04-2017 - 06-09-2017; in: "13th International Symposium on Functional π-Electron Systems", (2017). Keynote Lecture: Seventh International Conference "Modern Trends in Science" FMNS-2017, Blagoevgrad (invited); 06-14-2017 - 06-18-2017; in: "Seventh International Conference "Modern Trends in Science" FNMS-2017 Book of Abstracts", M. Mitov (ed. ); (2017), ISBN: 978-954-00-0121-0; 37 - 38. Talk: 43rd Euromicro Conference onSoftware Engineering and Advanced Applications (SEAA 2017), Wien; 08-30-2017 - 09-01-2017; in: "Proceedings 43rd Euromicro Conference on Software Engineering and Advanced Applications - SEAA 2017", IEEE, (2017), ISBN: 978-1-5386-2141-7; 189 - 193. Talk: 2017 IEEE 15th International Conference on Industrial Informatics (INDIN), Emden, Deutschland; 07-24-2017 - 07-26-2017; in: "Proceedings 2017 IEEE 15th International Conference on Industrial Informatics (INDIN)", IEEE, (2017), ISBN: 978-1-5386-0837-1; 526 - 532. Poster: 17. Österreichische Chemietage 2017, Salzburg; 09-25-2017 - 09-28-2017; in: "17. Österreichische Chemietage 2017", (2017), 1 pages. Talk: International Conference on Fundamentals of Software Engineering (FSEN 2017), Teheran, Iran; 04-26-2017 - 04-28-2017; in: "Fundamentals of Software Engineering", Springer, LNCS 10522 (2017), ISBN: 978-3-319-68972-2; 116 - 131. Talk: 17. Österreichische Chemietage 2017, Salzburg; 09-25-2017 - 09-28-2017; in: "17. Österreichische Chemietage 2017", (2017), 1 pages. Talk: 13th International Haifa Verification Conference (HVC 2017), Haifa, Israel; 11-13-2017 - 11-15-2017; in: "13th International Haifa Verification Conference (HVC)", O. Strichman, R. Tzoref-Brill (ed. ); Lecture Notes in Computer Science / Springer, 10629 / Cham (2017), ISBN: 978-3-319-70388-6; 115 - 130. Keynote Lecture: 26th EACSL Annual Conference on Computer Science Logic (CSL), Stockholm, Sweden (invited); 08-20-2017 - 08-24-2017; in: "Proceedings of the 26th EACSL Annual Conference on Computer Science Logic (CSL)", V. Goranko, M. Dam (ed. ); LIPIcs, 82 (2017), ISBN: 978-3-95977-045-3; 3:1. 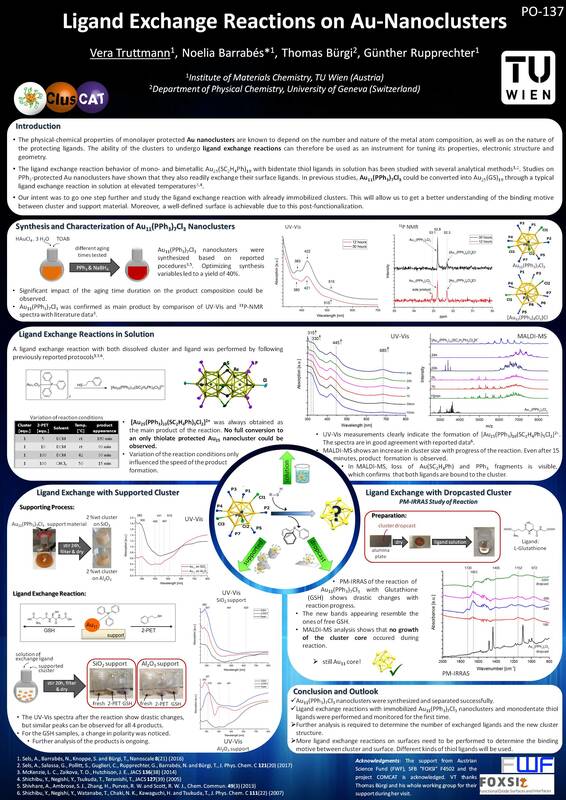 Poster: 17th International Symposium on Novel Aromatic Compounds, Stony Brook, NY, USA; 07-23-2017 - 07-28-2017; in: "17th International Symposium on Novel Aromatic Compounds", (2017), 1 pages. Talk: 13th International Symposium on Functional π-Electron Systems (Fπ-13), Hong Kong; 06-04-2017 - 06-09-2017; in: "13th International Symposium on Functional π-Electron Systems", (2017), 1 pages. Talk: Conference: Conference: 37th European Workshop for Rheumatology Research, Athen; 03-02-2017 - 03-04-2017; in: "Annals of the Rheumatic Diseases", Annals of the Rheumatic Diseases, Volume 76/Issue Suppl 1 (2017), 49 - 50. Poster: 10th Joint Meeting on Medicinal Chemistry, Dubrovnik, Croatia; 06-25-2017 - 06-28-2017; in: "10th Joint Meeting on Medicinal Chemistry - Book of Abstracts", (2017), 223. Poster: 10th Joint Meeting on Medicinal Chemistry, Dubrovnik, Croatia; 06-25-2017 - 06-28-2017; in: "10th Joint Meeting on Medicinal Chemistry - Book of Abstracts", (2017), 215. Poster: 10th Joint Meeting on Medicinal Chemistry, Dubrovnik, Croatia; 06-25-2017 - 06-28-2017; in: "10th Joint Meeting on Medicinal Chemistry - Book of Abstracts", (2017), 103. Poster: 17th Blue Danube Symposium on Heterocyclic Chemistry, Linz; 08-30-2017 - 09-02-2017; in: "17th Blue Danube Symposium on Heterocyclic Chemistry", (2017), 89. Poster: 17th Blue Danube Symposium on Heterocyclic Chemistry, Linz; 08-30-2017 - 09-02-2017; in: "17th Blue Danube Symposium on Heterocyclic Chemistry", (2017), 117. Talk: 27. Spektrometertagung 2017, Wien; 09-27-2017; in: "Book of Abstracts", (2017), 9. Talk: EUMETSAT Meteorological Satellite Conference 2017, Rome, Italy; 10-02-2017 - 10-06-2017; in: "Proceedings for the 2017 EUMETSAT Meteorological Satellite Conference", (2017). Keynote Lecture: 17th Blue Danube Symposium on Heterocyclic Chemistry, Linz (invited); 08-30-2017 - 09-02-2017; in: "17th Blue Danube Symposium on Heterocyclic Chemistry", (2017), 32. Poster: EUMETSAT Meteorological Satellite Conference 2017, Rome, Italy; 10-02-2017 - 10-06-2017; in: "Proceedings for the 2017 EUMETSAT Meteorological Satellite Conference", (2017). Keynote Lecture: 16th International Scientific Conference on Production Engineering, Zadar, Kroatien (invited); 06-08-2017 - 06-10-2017; in: "Proceedings of the CIM 2017", (2017), ISBN: 978-953-7689-04-9. Keynote Lecture: 10th Joint Meeting on Medicinal Chemistry, Dubrovnik, Croatia (invited); 06-25-2017 - 06-28-2017; in: "10th Joint Meeting on Medicinal Chemistry - Book of Abstracts", (2017), 57. Poster: 8th European Combustion Meeting, Dubrovnik, Kroatien; 04-18-2017 - 04-21-2017; in: "Digital Proceedings", (2017), ISBN: 978-953-59504-1-7; Paper ID ECM2017.0307, 6 pages. Talk: Metallomics 2017, Wien, Österreich; 08-13-2017 - 08-17-2017; in: "Book of Abstracts", (2017), 83. Poster: 2017 Euopean Winter Conference on Plasma Spectrochemistry, Sankt Anton, Arlberg; 02-19-2017 - 02-24-2017; in: "Book of Abstracts", (2017), 300. Poster: 5. Central European Biomass Conference, Graz; 01-18-2017 - 01-20-2017; in: "Tagungsband/ Proceedings", (2017), ISBN: 978-3-9504380-1-7; 206. Poster: 2017 Euopean Winter Conference on Plasma Spectrochemistry, Sankt Anton, Arlberg; 02-19-2017 - 02-24-2017; in: "Book of Abstracts", (2017), 261. Talk: 2017 Euopean Winter Conference on Plasma Spectrochemistry, Sankt Anton, Arlberg; 02-19-2017 - 02-24-2017; in: "Book of Abstracts", (2017), 127. Talk: 2017 Euopean Winter Conference on Plasma Spectrochemistry, Sankt Anton, Arlberg; 02-19-2017 - 02-24-2017; in: "Book of Abstracts", (2017), 121. Talk: 2017 Euopean Winter Conference on Plasma Spectrochemistry, Sankt Anton, Arlberg; 02-19-2017 - 02-24-2017; in: "Book of Abstracts", (2017), 102. Poster: TOPHPC - International Congress on High Performance Computing and Big Data Analytics, Teheran, Iran; 04-24-2017 - 04-26-2017; in: "Proceedings", (2017), 3 pages. Talk: Review Meeting Avenue21, Wien (invited); 06-27-2017 - 06-28-2017; in: "Avenue21. A comparative impact assessment of autonomous vehicles in European cities", AVENUE21, (2017), 18 - 19. Talk: CapaCity Workshop, Györ (invited); 09-26-2017 - 09-27-2017; in: "CapaCity Workshop Report", (2017), 34 - 51. Talk: 21. Internationale Tagung des Arbeitskreises Eisenbahntechnik, Graz (invited); 09-26-2017; in: "21. Internationale Tagung des Arbeitskreises Eisenbahntechnik. Fahrwegoptimierung des Rad/Schiene-Systems. Verfügbarkeit der Infrastruktur", ÖVG (ed. ); Österreichische Verkehrswissenschaftlliche Gesellschaft, 109 (2017), 27 - 29. Talk: esib/2017 - European Summit of Industrial Biotechnology, Graz (invited); 11-14-2017 - 11-16-2017; in: "esib/2017", (2017), 217 pages. Talk: 17. Österreichische Chemietage 2017, Salzburg (invited); 09-25-2017 - 09-28-2017; in: "17. Österreichische Chemietage", (2017). Talk: 2017 IEEE 5th International Conference on Serious Games and Applications for Health (SeGAH), Perth, Australia, from 2-4 April 2017; 04-02-2017 - 04-04-2017; in: "2017 IEEE 5th International Conference on Serious Games and Applications for Health (SeGAH)", IEEE, (2017), ISBN: 978-1-5090-5483-1; 1 - 8. Talk: 35th Informal Meeting on Mass Spectrometry, Aussois, France (invited); 05-07-2017 - 05-11-2017; in: "35th Informal Meetng on Mass Spectrometry Programm and Book of Abstract", (2017), 30. Poster: Expanding Horizons. Dritte Österreichische Citizen Science Konferenz 2017, Wien; 03-02-2017 - 03-04-2017; in: "Expanding Horizons. Dritte Österreichische Citizen Science Konferenz 2017", (2017), 69. Poster: ISPOR 20th Annual European Congress, Glasgow, Scotland; 11-04-2017 - 11-08-2017; in: "ISPOR 20th European Congress Research Abstracts", Value in Health, 20/9 (2017), ISSN: 1098-3015; A744. Poster: ISPOR 20th Annual European Congress, Glasgow, Scotland; 11-04-2017 - 11-08-2017; in: "ISPOR 20th European Congress Research Abstracts", Value in Health - The Journal of The International Society for Pharmaeconomics and Outcome Research, 20/9 (2017), ISSN: 1098-3015; A514. Talk: 11th Panhellenic Logic Symposium, Delphi, Greece (invited); 07-13-2017; in: "Proceedings of the 11th Panhellenic Logic Symposium", (2017), 32 - 38. Talk: Twelfth International Conference on Computational Semantics, Montpellier, Frankreich; 09-19-2017 - 09-22-2017; in: "Proceedings of the Twelfth International Conference on Computational Semantics (IWCS)", ACL anthology, W17-68 (2017). Poster: ISPOR 20th Annual European Congress, Glasgow, Scotland; 11-04-2017 - 11-08-2017; in: "ISPOR 20th European Congress Research Abstracts", Value in Health, 20/9 (2017), ISSN: 1098-3015; A798 - A799. Talk: Austrian HPC Meeting 2017, Grundlsee; 03-01-2017 - 03-03-2017; in: "AHPC 17", (2017), 6. Poster: ISPOR 20th Annual European Congress, Glasgow, Scotland; 11-04-2017 - 11-08-2017; in: "ISPOR 20th European Congress Research Abstracts", Value in Health - The Journal of The International Society for Pharmaeconomics and Outcome Research, 20/9/Lawrenceville, NJ, USA (2017), ISSN: 1098-3015; A745. Talk: 17. Fachtagung des GI-Fachbereichs Datenbanken und Informationssysteme, Stuttgart, Deutschland; 03-06-2017 - 03-10-2017; in: "Datenbanksysteme für Business, Technologie und Web (BTW 2017), 17. Fachtagung des GI-Fachbereichs Datenbanken und Informationssysteme (DBIS), Workshopband", (2017), ISBN: 978-3-88579-660-2; 169 - 180. Talk: Theorietage 2017 der Fachgruppe Automaten und Formale Sprachen der deutschen Gesellschaft für Informatik, Bonn, Deutschland; 09-18-2017 - 09-22-2017; in: "Theorietag 2017, Technischer Bericht", H. Fernau, Bonn (2017), 1 - 5. Talk: Proceedings of the Thirty-First AAAI Conference on Artificial Intelligence, California; 02-04-2017 - 02-09-2017; in: "Proceedings of the Thirty-First AAAI Conference on Artificial Intelligence", (2017), ISBN: 978-1-57735-781-0; 815 - 821. Talk: Proceedings of the 42nd International Symposium on Mathematical Foundations of Computer Science, Aalborg Denmark; 08-21-2017 - 08-25-2017; in: "Proceedings of the 42nd International Symposium on Mathematical Foundations of Computer Science", Proceedings of the 42nd International Symposium on Mathematical Foundations of Computer Science, (2017), ISBN: 978-3-95977-046-0; 1 - 15. Talk: 4th Symposium on Predictive Control of Electrical Drives and Power Electronics PRECEDE 2017, Pilsen, Czech Republic; 09-04-2017 - 09-06-2017; in: "Proceedings 2017 IEEE International Symposium on Predictive Control of Electrical Drives and Power Electronics (PRECEDE)", (2017), 60 - 65. Talk: 17. Österreichische Chemietage 2017, Salzburg; 09-25-2017 - 09-28-2017; in: "17. Österreichische Chemietage 2017", (2017). 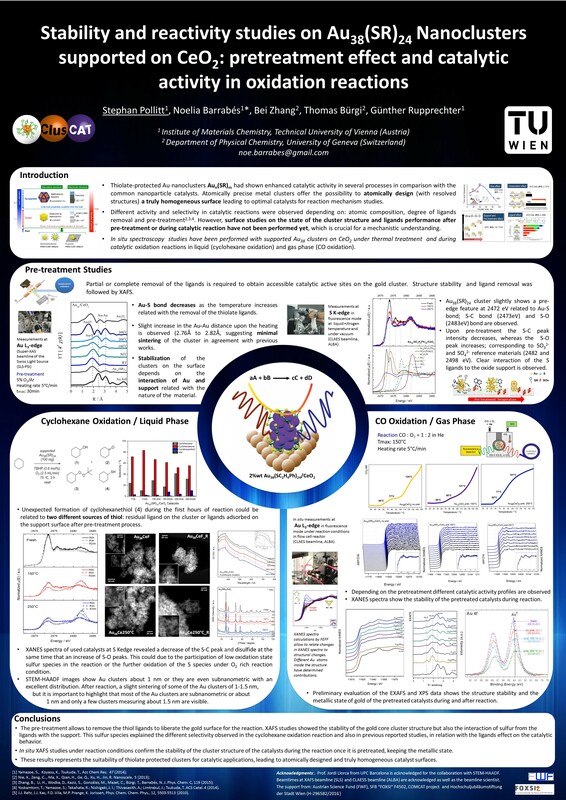 Poster: EUROPACAT 13th European Congress on Catalysis, Florence; 08-27-2017 - 08-31-2017; in: "Europacat2017", (2017). Talk: The European Conference on Combinatorics, Graph Theory and Applications (EUROCOMB) 2017, Tu Wien; 08-28-2017 - 09-01-2017; in: "Special Issue of Electronic Notes in Discrete Mathematics", M. Drmota, C. Krattenthaler, J. Nesetril, M. Kang (ed. ); Elsevier, Volume 61 (2017), 61 - 67. Talk: VSS 2017 - Vienna young Scientists Symposium, Wien; 06-01-2017 - 06-02-2017; in: "Book of Abstracts", (2017), ISBN: 978-3-9504017-5-2; 42 - 43. Talk: VSS 2017 - Vienna young Scientists Symposium, Wien; 06-01-2017 - 06-02-2017; in: "Book of Abstracts", (2017), ISBN: 978-3-9504017-5-2; 80 - 81. Talk: Doctoral Consortium, Challenge, Industry Track, Tutorials and Posters @ RuleML+RR 2017 hosted by International Joint Conference on Rules and Reasoning 2017 (RuleML+RR 2017), London, UK; 07-11-2017 - 07-15-2017; in: "Nick Bassiliades, Antonis Bikakis, Stefania Costantini, Enrico Franconi, Adrian Giurca, Roman Kontchakov, Theodore Patkos, Fariba Sadri, William Van Woensel: Proceedings of the Doctoral Consortium, Challenge, Industry Track, Tutorials and Posters @ RuleML+RR 2017 hosted by International Joint Conference on Rules and Reasoning 2017 (RuleML+RR 2017)", N. Bassiliades, A. Bikakis, S. Constantini, E. Franconi, A. Giurca, R. Kontchakov, T. Patkos, F. Sadri, W. Van Woensel (ed. ); CEUR Workshop Proceedings, 1875 (2017), ISSN: 1613-0073. Talk: Web Stream Processing workshop (WSP 2017) and International Workshop on Ontology Modularity, Contextuality, and Evolution (WOMoCoE 2017), Vienna; 10-22-2017; in: "Joint Proceedings of the Web Stream Processing workshop (WSP 2017) and the 2nd International Workshop on Ontology Modularity, Contextuality, and Evolution (WOMoCoE 2017) co-located with 16th International Semantic Web Conference (ISWC 2017)", D. Dell´Aglio, D. Anicic, P. Barnaghi, E. Della Valle, D. McGuinness, L. Bozzato, T. Eiter, M. Homola, D. Porello (ed. ); CEUR Workshop Proceedings, 1936 (2017), ISSN: 1613-0073; 17 - 32. Talk: 13. Minisymposium Verfahrenstechnik (13th Minisymposium Chemical and Process Engineering), Innsbruck; 03-29-2017 - 03-30-2017; in: "Book of Abstracts", (2017). Talk: 43rd Annual Conference of the IEEE Industrial Electronics Society IECON 2017, Bejing, China; 10-29-2017 - 11-01-2017; in: "IECON 2017", IEEE INdustrial Electronics Society, Bejing China (2017). Talk: ISMPC17: International Symposium on Monolayer Protected Clusters, Monte Verita; 08-13-2017 - 08-16-2017; in: "ISMPC17: International Symposium on Monolayer Protected Clusters", (2017). Talk: 26th International Joint Conference on Artificial Intelligence (IJCAI 2017), Melbourne, Australia; 08-19-2017 - 08-25-2017; in: "Proceedings of the 26th International Joint Conference on Artificial Intelligence (IJCAI 2017)", C. Sierra (ed. ); (2017), ISBN: 978-0-9992411-0-3; 5060 - 5064. Poster: 17th Austrian Chemistry Days 2017 - Joint Meeting of the Swiss & Austrian Chemical Societies, Salzburg; 09-25-2017 - 09-28-2017; in: "17th Austrian Chemistry Days 2017", (2017). Talk: 26th International Joint Conference on Artificial Intelligence (IJCAI 2017), Melbourne, Australia; 08-19-2017 - 08-25-2017; in: "Proceedings of the 26th International Joint Conference on Artificial Intelligence (IJCAI 2017)", C. Sierra (ed. ); (2017), ISBN: 978-0-9992411-0-3; 1000 - 1007. Talk: SINTEF - 12th International Conference on CFD in Oil & Gas, Metallurgical and Process Industries, Trondheim, Norwegen; 05-30-2017 - 06-01-2017; in: "Sintef Proceedings , https://brage.bibsys.no/xmlui/handle/11250/2480090", (2017), ISBN: 978-82-536-1544-8; 675 - 682. Talk: IEEE International Symposium Diagnostics for Electric Machines, Power Electronics & Drives (SDEMPED), Tinos, Griechenland; 08-29-2017 - 09-01-2017; in: "2017 IEEE 11th International Symposium on Diagnostics for Electrical Machines, Power Electronics and Drives (SDEMPED)", IEEE, (2017), ISBN: 978-1-5090-0409-6; 52 - 57. Poster: ISMPC17: International Symposium on Monolayer Protected Clusters, Monte Verita; 08-13-2017 - 08-16-2017; in: "ISMPC17: International Symposium on Monolayer Protected Clusters - Book of Abstracts", (2017). Talk: AISTech2017, Nashville, USA; 05-08-2017 - 05-11-2017; in: "Proceedings", (2017), ISSN: 1551-6997; 15 pages. Talk: IEEE International Electric Machines and Drives Conference (IEMDC), Miami, Florida; 05-21-2017 - 05-24-2017; in: "Ieee Iemdc 2017", IEEE, (2017). Poster: 44th ESAO and 7th IFAO Congress, Vienna; 09-06-2017 - 09-09-2017; in: "International Journal of Artificial Organs", Wichtig Publishing, Volume 40 Number 8 August (2017), ISSN: 0391-3988; 458. Talk: Metaheuristics: Proceeding of the MIC and MAEB 2017 Conferences, Metaheuristics: Proceeding of the MIC and MAEB 2017 Conferences; 07-04-2017 - 07-07-2017; in: "http://mic2017.upf.edu/proceedings/", (2017), 463 - 472. Talk: Computer Aided Systems Theory - EUROCAST 2017, Spain; 02-19-2017 - 02-24-2017; in: "Computer Aided Systems Theory - EUROCAST 2017", (2017), 106 - 107. Talk: IAHS Scientific Assembly 2017, Port Elizabeth, South Africa; 07-10-2017 - 07-14-2017; in: "IAHS Scientific Assembly 2017", (2017), Paper ID IAHS2017-179, 1 pages. Talk: IAHS Scientific Assembly 2017, Port Elizabeth, South Africa; 07-10-2017 - 07-14-2017; in: "IAHS Scientific Assembly 2017", (2017), Paper ID IAHS2017-249, 1 pages. Poster: IAHS Scientific Assembly 2017, Port Elizabeth, South Africa; 07-10-2017 - 07-14-2017; in: "IAHS Scientific Assembly 2017", (2017), Paper ID IAHS2017-277, 1 pages. Poster: IAHS Scientific Assembly 2017, Port Elizabeth, South Africa; 07-10-2017 - 07-14-2017; in: "IAHS Scientific Assembly 2017", (2017), Paper ID IAHS2017-347-1, 1 pages. Talk: 43rd Annual Conference of the IEEE Industrial Electronics Society IECON 2017, Peking, China; 10-29-2017 - 11-01-2017; in: "IEEE", IEEE INdustrial Electronics Society, Bejing China (2017), 1983 - 1989. Keynote Lecture: 67th General Assembly of CIRP, Lugano, Italien (invited); 08-20-2017 - 08-26-2017; in: "Cirp Annals 2017", Elsevier, (2017), ISSN: 0007-8506; 778 - 802. Poster: IAHS Scientific Assembly 2017, Port Elizabeth, South Africa; 07-10-2017 - 07-14-2017; in: "IAHS Scientific Assembly 2017", (2017), Paper ID IAHS2017-232, 1 pages. Poster: IAHS Scientific Assembly 2017, Port Elizabeth, South Africa; 07-10-2017 - 07-14-2017; in: "IAHS Scientific Assembly 2017", (2017), Paper ID IAHS2017-57, 1 pages. Talk: IAHS Scientific Assembly 2017, Port Elizabeth, South Africa; 07-10-2017 - 07-14-2017; in: "IAHS Scientific Assembly 2017", (2017), Paper ID IAHS2017-56, 1 pages. Poster: Detection and Classification of Acoustic Scenes and Events, Munich, Germany; 11-16-2017 - 11-17-2017; in: "Proceedings of the Detection and Classification of Acoustic Scenes and Events 2017 Workshop (DCASE2017)", (2017), ISBN: 978-952-15-4042-4; 5 pages. Poster: Detection and Classification of Acoustic Scenes and Events, Munich, Germany; 11-16-2017 - 11-17-2017; in: "Proceedings of the Detection and Classification of Acoustic Scenes and Events 2017 Workshop (DCASE2017)", (2017), ISBN: 978-952-15-4042-4; 118 - 122. Talk: 10th Forum Media Technology 2017, St. Pölten; 11-29-2017 - 11-30-2017; in: "10th Forum Media Technology 2017", (2017), 4 pages. Talk: BirdCLEF, Dublin, Ireland; 09-11-2017 - 09-14-2017; in: "BirdCLEF 2017", (2017), 6 pages. Talk: 35th Conference of the International Society of Biomechanics in Sports, Köln; 06-14-2017 - 06-18-2017; in: "International Society of Biomechanics Conference Proceedings", N. Babu Rajendra Kurup, M. Puchinger, M. Gföhler (ed. ); International Society of Biomechanics in Sports (ISBS), German Sport University Cologne, Köln (Cologne) (2017), Paper ID 35, 4 pages. Talk: Salzburger Landtag, Salzburg (invited); 05-10-2017; in: "Salzburger Landtag, 50 Jahre Altstadterhaltungsgesetz Salzburg", (2017), 104 - 116. Talk: Erzbistum Paderborn - 1000 Jahre Bartholomäuskapelle, Paderborn (invited); 10-07-2017; in: "Internationales Symposium 1000 Jahre Bartholomäuskapelle in Paderborn, Paderborn", (2017), 304 - 311. Talk: Verwundbarkeit und Gefährdungslagen, Berlin (invited); 01-23-2017 - 01-24-2017; in: "Grünbuch Soziale Teilhabe in Deutschland. Eine Bestandsaufnahme", (2017), 100 - 108. Keynote Lecture: 2. Baudynamikseminar, Biberach (invited); 10-20-2017 - 10-21-2017; in: "2. Baudynamikseminar", Wissenschaft & Praxis, 187 (2017), ISSN: 1615-4266; 7-1 - 7-17. Poster: ISMPC17: International Symposium on Monolayer Protected Clusters, Monte Verita, Switzerland; 08-13-2017 - 08-16-2017; in: "ISMPC17: International Symposium on Monolayer Protected Clusters", (2017). Poster: 22nd IEEE International Conference on Emerging Technologies And Factory Automation (ETFA 2017), Limassol; 09-12-2017 - 09-15-2017; in: "Proceedings of the 22nd IEEE International Conference on Emerging Technologies And Factory Automation", (2017), 1 - 4. Talk: IEEE 26th International Symposium on Industrial Electronics (ISIE), 2017, Edinburgh, United Kingdom; 06-19-2017 - 06-21-2017; in: "Proc. ISIE 2017", Institute of Electrical and Electronics Engineers (IEEE), Edinburgh, United Kingdom (2017), ISSN: 2163-5145; 1234 - 1239. Talk: Computer Aided Systems Theory - EUROCAST 2017, Spain; 02-19-2017 - 02-24-2017; in: "Computer Aided Systems Theory - EUROCAST 2017", (2017), 90 - 91. Talk: Ulam Computer Simulations Workshop, Lviv, Ukraine (invited); 06-21-2017 - 06-24-2017; in: "Challenges & Opportunities in Molecular Simulations", (2017), 23. Keynote Lecture: IFMA World Work Place Europe, Stockholm; 05-30-2017 - 05-31-2017; in: "IFMA World Workplace Europe, Academic and Research Track, Conference Proceedings", Stockholm (2017), 34 - 41. Talk: Evolutionary Computation in Combinatorial Optimization (EvoCOP), Amsterdam; 04-19-2017 - 04-21-2017; in: "Evolutionary Computation in Combinatorial Optimization", Evolutionary Computation in Combinatorial Optimization, (2017), ISBN: 978-3-319-55452-5; 91 - 107.